Last year, the concept of secular stagnation was reintroduced into the economics lexicon as a way of explaining the lack of growth in advanced nations. Apparently, we were facing a long-term future of low growth and elevated levels of unemployment and there was not much we could do about it. Now it seems more and more commentators and economists are jumping on the bandwagon such that the concept is said to be “taking economics by storm” – see Secular Stagnation: the scary theory that’s taking economics by storm. The only problem is that it first entered the economics debate in the late 1930s when economies were still caught up in the stagnation of the Great Depression. Then like now the hypothesis is a dud. The problem in the 1930s was dramatically overcome by the onset of World War 2 as governments on both sides of the conflict increased their net spending (fiscal deficits) substantially. The commitment to full employment in the peacetime that followed maintained growth and prosperity for decades until the neo-liberal bean counters regained dominance and started to attack fiscal activism. The cure to the slow growth and high unemployment now is the same as it was then – government deficits are way to small. What exactly is secular stagnation? Some believe it means the response of potential output to a recession, such that firms stop investing in new productive capacity as their sales fall and the lack of investment clearly undermines the future growth path of the economy. I have written about that in several blogs – most recently – The myopia of neo-liberalism and the IMF is now evident to all. So this is a situation where aggregate supply potential contracts as a result of an initial prolonged decline in aggregate spending and the economy shrinks in terms of how fast it can grow. Others claim that is is not so much about a supply response (capacity shrinking) but an on-going and worsening aggregate demand (spending) respond which leads to stagnation in economic growth. The examples cited are a decline in the working-age population, which allegedly undermine spending and leave the economy “facing persistent shortfalls of demand” (see Paul Krugman, What Secular Stagnation Isn’t – October 24, 2014). In March 1939, Keynesian economist Alvin Hansen published an article – Economic Progress and Declining Population Growth – the link takes you to JSTOR if you have access. It was published in the American Economic Review, Vol 29, No. 1, pp.1-15. Hansen was worried about the decline in population growth in the US in the 1930s, which he noted marked the end of the rapid growth in the 25 years prior to the Great Depression. He was loath to accept the line put by the Malthusians who thought a slowdown in population growth would be beneficial because it would alleviate scarcity of resources. … it would be an unwarranted optimism to deny that there are implicit in the current drastic shift from rapid expansion to cessation of population growth, serious structural maladjustments which can be avoided or mitigated only if economic policies, appropriate to the changed situation, are applied. His main argument is that with a slowdown in population growth, would reduce the scope for “widening” the market and reduce “inventiveness”, which, in turn, would reduce “the production of wealth”. Growth begets growth and resource scarcities are pushed ahead by new invention and discoveries. That is why he considered the arguments by David Riccardo and Thomas Malthus in the C19th about the problems of too many people to be unnecessarily pessimistic. … tend to make business recoveries weak and anaemic and which tend to prolong and deepen the course of depressions. This is the essence of secular stagnation-sick recoveries which die in their infancy and depressions which feed on themselves and leave a hard and seemingly immovable core of unemployment. And so the term – secular stagnation – was born. Large investment expenditures were considered necessary for sustained growth “to fill the gap between consumption expenditures and that level of income which could be achieved were all the factors employed”. Of-course, the investment can be private and/or public. The point is that if consumers do not want to spend all their income (and the external sector is not making up the difference), then investment spending must be sufficient to fill the shortfall. If not, sales will fall short of expectations and production will decline and unemployment will rise. He didn’t believe the cure for stagnation in investment would come from lowering interest rates, which is the belief that most people hold. I venture to assert that the role of the rate of interest as a determinant of investment has occupied a place larger than it deserves in our thinking. The clue is that firms will not invest in new productive capacity no matter how cheap the funds to engage in that investment become if they do not expect to be able to sell the extra output. The central bank can drive the interest rate down to low levels and firms will still not borrow and spend. The similarities with the situation today are strong in this regard. The reliance on monetary policy to get the advanced economies out of the crisis was misplaced and reflected a poor understanding of what drives national income growth. Hansen clearly knew this in 1939 as did many other Keynesian economists. It was the classical/neo-classical economists who were unable to let go of the loanable funds doctrine, which said that saving and investment are brought into balance with interest rate adjustments. So if consumers do not want to spend they must be saving and that extra spending can come from investment if interest rates fall. The loanable funds doctrine remains a central part of the mainstream neo-liberal economic theory and is wrong to the core. Relating this back to population growth, Hansen argued that a declining growth rate and hence an ageing population shifts the pattern of consumer demand away from, say housing, towards personal care services. The former “calls for large capital outlays, while the demand for personal services can be met without large investment expenditures”. … a shift from a rapidly growing population to a stationary or declining one may so alter the composition of the final flow of consumption goods that the ratio of capital to output as a whole will tend to decline. So without rapid technological development which spawns new investment, Hansen believed the capitalist system would find it hard to maintain full employment as the population growth rate fell. The economy would stagnate with inadequate investment expenditure. In this sense, he opposed the view that technology created unemployment. Indeed, he argued strongly that innovation provided a spur to investment spending, which allowed economic growth to persist. His point – consistent with his Keynesian leanings – was that the market system left to its own devices would stagnate and no market forces would promote a correction. Keynes had clearly demonstrated the capacity and propensity of the capitalist system to bog down in steady-states (where there are no forces for change) which delivered persistently high mass unemployment. Keynes showed that in instances such as this the only way out was for an external (to the market) spending injection to be made to the economy – that is, government spending, which would kickstart the private economy. And this is exactly what happened about the time Hansen was promoting the idea of secular stagnation in 1939. Hansen’s pessimism or worries about the market system drifting into secular stagnation were solved within the year by the onset of the Second World War and the related war expenditures. He knew full well (in his article) that “continued governmental spending to the point of full employment” was possible but risked inflation if the growth was pushed beyond the capacity of the economy to absorb the extra spending. He acknowledged that the same argument (about the dangers of inflation) “could equally well be directed against private investment once the upper danger zone has been reached”. The massive public spending associated with the war effort – earlier in Germany and a bit later in the allied nations, ended the Great Depression with a bang (sorry). And as Matthew Yglesias notes in his article – Secular Stagnation: the scary theory that’s taking economics by storm – thoughts of secular stagnation were forgotten after the war. Why? He doesn’t elaborate. But the answer is that the advanced nations understood that they could maintain full employments in peace time by ensuring that the government deficits were sufficient to fund the desire of the non-government sector overall to save (that is, not spend its total income). Hansen also didn’t foresee the return to more robust population growth in the Post WW2 period. But economists of the day clearly understood that economic growth could be maintained by appropriate fiscal policy interventions. Nothing has changed on that score yet economists are now talking about secular stagnation as if it is something we are helpless to remedy. At last year’s IMF conference Lawrence Summers, presumably trying to remain relevant invoked the idea again to explain why the major economies were languishing in low growth (or still in recession as in the case of Europe) at the time. A number of economists have jumped on the bandwagon – which is a train to nowhere when you think more clearly about the issue. They all highlight how the ‘recovery’ from the latest crisis has been very different to previous recessions – much slower and weaker and that monetary policy seems to be ineffective despite massive bond buying programs by central banks. Even today, the unemployment rate remains on the high side even as the Federal Reserve has held interest rates near zero for much longer than anyone initially thought possible. None of this should surprise anyone who really understands how the monetary system operates and the way in which people behave when confronted with mass unemployment and loss of income. Hoping for a banking-led credit recovery – as central banks increased bank reserves – fundamentally misunderstood the role of reserves and the fact that banks do not lend them to consumers or firms. Monetary policy was never going to be sufficient to resolve the spending shortfall created in the early days of the GFC. The other major change in this recession compared to previous recessions has been the dominance of neo-liberal thinking and its eschewal of public deficits. There are overlaps with the early days of the Great Depression when the British Treasury view dominated. Please read my blog – Macroeconomic constraints render individual action powerless – for more discussion on this point. The cuts in wages and reliance on monetary policy then failed dramatically and the Depression deepened in most nations. It was only the massive aggregate spending boost that ended it a decade or so after it began. While Hansen thought that population growth would drive investment necessary to keep total spending growing, we have better alternatives now that we better understand the ecological limits on growth and how many people the planet can support in a sustainable fashion. Cities are already clogged and transport systems are failing. The last thing we want is for massive new housing investment which place people miles out of the city and reliant on cars to commute etc, in the absence of sound public transport systems. 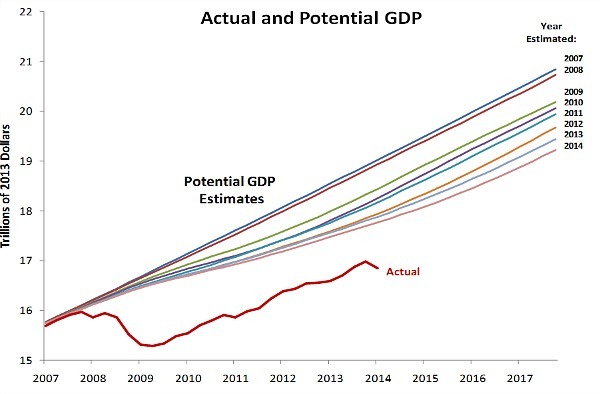 The Washington Post (October 31, 2014) considered the secular stagnation theory – This is why the economy has fallen and it can’t get up – and recyled the graph that Lawrence Summers introduced, which shows actual real GDP growth and the various (declining) estimates of potential GDP produced by the US Congressional Budget Office as the crisis endured. And that the “secular stagnation could turn deficient demand into deficient supply” via the process of hysteresis. … because the long-term unemployed could become unemployable, and too little investment today could create bottlenecks that prevent the economy from growing as much tomorrow. This is only correct if we continue to rely on the private market for salvation. I have written about this before (it was a major part of my PhD in fact). For example, most recently – The myopia of neo-liberalism and the IMF is now evident to all – for more discussion on this point. need … more infrastructure spending, and less tut-tutting about the deficit that, unlike our anemic recovery, isn’t an urgent problem. We need to realize that just waiting for catchup growth is the new waiting for Godot—and we can’t afford for it to not show up. Exactly, except that the fiscal deficit can never really be a problem unless the government is stupid and pushed it beyond the capacity of the economy to absorb the extra nominal spending. The secular stagnation hypothesis only avoids being a non sequitur if we exclude the most important insight from the analysis – that the government can always spur growth through increased spending. The secular stagnation claims are only getting oxygen because we still are caught up in the neo-liberal spell. The long-term unemployed are not a constraint on growth if the government chooses to intervene. While private sector investment, which is governed by profitability considerations can be insufficient (during and after a recession) to expand potential output fast enough to re-absorb the unemployed who lost their jobs in the downturn, such a situation does not apply to a currency-issuing government intent on introducing a Job Guarantee. The point is that the introduction of a Job Guarantee job simultaneously creates the extra productive capacity required for program viability. The spending capacity of currency-issuing governments is not constrained by expectations of future aggregate demand in the same way that pessimism erodes the spending decisions of private firms who are guided by profitability considerations. From the research I have been involved with for many years, the majority of jobs identified as being suitable for low skill workers would be in the low capital intensity areas of work, although this would vary across the specific need areas (transport amenity; community welfare services; public health and safety; and recreation and culture etc). The upshot is that the government has both the financial and real capacity to invest in and procure the required capital in a timely manner. Pessimism, which constrains private sector investment in productive capacity in the early days of recovery, doesn’t enter the picture. Please read my blog – A Job Guarantee job creates the required extra productive capacity – for more discussion on this point. It is obvious that today’s situation where the advanced economies have struggled to restore growth by relying on self-correcting market forces is the same problem Keynes and Hansen faced in the 1930s. The cure is the same cure that was discovered with the onset of WW2 – government spending can replace reluctant private spending. Without fiscal intervention, the private market can get stuck in equilibrium states (where all decisions are being ratified by actual outcomes) which involve very high levels of unemployment. So firms come to expect very low growth and reduce the rate of capacity creation while consumers adopt very cautious spending patterns. The resulting output and income generation reinforces these expectations and there is no dynamic to prompt a change. Firms have enough productive capacity and the economy gets stuck in this high unemployment state. The problem is compounded in the Eurozone because, ignoring the ridiculous fiscal constraints imposed by the Stability and Growth Pact, the Member State governments are financially constrained by the fact they use a foreign currency and the central bank (which issues that currency) is unwilling to underwrite fiscal deficits. Currency-issuing nations are not constrained in that way at all. Its fiscal constraints are all voluntarily imposed and within the structure of the existing monetary system could be eliminated immediately. The Eurozone constraints are inherent in the structure of their monetary system and would require some changes to the Treaty – a torturous process. A Eurozone nation would be better advised to abandon the Euro and reinstate its own currency – something it could do in a very short time period if it had the political will. But a currency-issuing nation could immediately create stronger economic growth with a Job Guarantee followed by other spending initiatives. The claim that slow growth is due to a secular stagnation only survives because the economics debate is captured by the neo-liberal Groupthink. The growth would have returned more or less as usual after the downturn if governments had have expanded their deficits sufficiently and not tried to reduce them prematurely. European governments should in almost all cases have significantly larger deficits (double or larger in some cases) to address the medium- to longer-term effects of the crisis. If the ECB guaranteed all debt issuance in the Eurozone, there would be no need for such austerity. What all this means is that governments should do everything within their capacity to avoid recessions. Not only does a strategy of early policy intervention avoid massive short-run income losses and the sharp rise in unemployment that accompany recession, but the longer term damage to the supply capacity of the economy and the deterioration in the quality of the labour force can also be avoided. A national, currency-issuing government can always provide sufficient aggregate spending in a relatively short period of time to offset a collapse in non-government spending, which, if otherwise ignored, would lead to these damaging short-run and long-run consequences. The “waiting for the market to work” approach is vastly inferior and not only ruins the lives of individuals who are forced to disproportionately endure the costs of the economic downturn, but, also undermines future prosperity for their children and later generations. A note to regular readers. Some of the comments recently have been about the need to shift to socialism and abandon the destructive tendencies of capitalism. Apparently, this means that Modern Monetary Theory (MMT) somehow misses the point. Not at all. MMT provides an understanding of how monetary systems operate irrespective of whether the means of production (capital) is privately owned (Capitalism), state owned (Socialism) or not “owned” at all (Communism). The same issues arise – including those that we have discussed in today’s blog. It’s amazing how idiots like Summers and Rogoff get to the top of the economics profession. The whole thing has always sounded fishy to me. Not enough spending? Then spend more. Of course we are facing massive environmental problems, but that is not a ‘secular stagnation’, it’s an ‘all-time biggest challenge’. Astonishingly, we cannot invest in renewable energy, in energy conservation, etc., because the states of the world cannot ‘sacrifice future generations’. Apparently, climate change is not a big deal for ‘our children’, nor is private debt (ZIRP is all over the place); but public debt? No no no, let’s not be irresponsible. A eloquent projection of all that is wrong with Keynesian war economy efforts. A committed social creditor could not have put forth his criciticisms better. The nightmare of producing goods so as to destroy them seems to be beyond you Bill. They can be destroyed in the battlefield or depreciated into dust on the consumerist eating table but in both cases they are not used to enrich the human soul. They merely enrich the hpercapitalists. The waste , the waste – the waste of it all. How can you justify increasing capacity to do work in absurdly overbuilt economies such as Spain or Ireland. Surely the first piority is to give purchasing power back to people so thet can at least utilize existing capacity. Just to remind you Bill – the supposed purpose of the machines was to reduce work and not to increase it. Dork, you appear to be responding to a post that Bill didn’t write but rather than that you have created out of it based on another agenda. The post as I read it does not say or imply what you appear to think it does. Let me make only a couple of points. Your first sentence is misleading. While the WW2 war economy did conform to Keynesian policy stipulations, the way you have stated it makes it look at though Keynes advicated it as a way out of a depression. Nothing could be further from the truth. He thought war a poor mechanism for solving economic and related problems. And this is related to your final sentence. Since I know Bill has read Keynes’ piece on the future of our grandchildren, Keynes, and Bill himself, both have advocated a better economic and political system than the ones we have been able to produce so far would enable people to both work less and enjoy, in Keynes’ words, the banefits of science, the arts, and culture. As for built-in obsolescence, which is what you seem to be referring to without mentioning it directly, this is definitely a problem in our current and even past economic arrangements and needs to be addressed, but it has nothing to do with the post itself. You appear, to me at least, to be responding to something that is in your own head but has little relationship to the post itself. In my opinion, investments are like exports in that they are costs. Exports are only the means to finance imports and investment is only a means to obtain consumption. What matters, for instance, is food production, and the production of farm machinery is only a means to produce food. Tractors are only an instrument to obtain food. This implies that it is an advantage if the capital/output ratio falls. It would be comparable to an improvement in the terms of trade. If the capital/output ratio goes down, we can get more consumption from the same quantity of labor because less labor is required to produce capital goods. If we can produce the same amount of wheat with fewer tractors of the same price, than the productivity of capital goes up. It is like getting higher yields from the same area of land. We should not confuse the stagnation hypothesis with the hypothesis of technological unemployment. Some people are arguing that in the foreseeable future there will such rapid progress in smart machines that a lot people will be displaced by machines and that they will find it hard to find new jobs because everywhere machines are displacing people. This argument assumes that technological progress is more rapid than people’s capacity to acquire new skills. This technological unemployment is compatible with economic growth. Suppose that the labor force consists of 10 million people. In one decade, 2 million of them lose their job because of technological progress. Only half of those 2 million can find a new job. If the productivity of the remaining 9 million who still have a job has increased by 30%, then there is still economic growth of about 17%, (9 x 1.3)/10. If this is going to happen, than a JG program would have to employ more and more people. Life and money : being a critical examination of the principles and practice of orthodox economics and a practical scheme for remedying the present industrial and financial chaos. He likens it to a very crude form of Sisyphism -A policy of spending as a solution to problems. I must take some issue with your definition of socialism, since the implication is that a situation where unionised workers or cooperatives who privately (but collectively) own their own workplaces, is near enough to a situation where some body of democratically representative authorities control the majority if the means of production. How is the MMT textbook coming along? Are you close to having it published? Keyenes then goes on and gives his classic line : and states the object of saving is to release labour for employment on producing capital goods (houses ,cars etc)but if there is already a large surplus of unemployed then the effect of saving is to add to such surplus. He states if there is already a large surplus of goods over the ability of the community to purchase it .what then ? Well the effect of saving is merely to add to this surplus – which by the way is only in surplus because those whose work is not needed to produce it are not allowed to consume it. Saving in fact under present (esp euro conditions) conditions means allowing goods already produced to go to waste so as to create living space for more goods. This can be seen most starkly in Ireland under the present “housing shortage” which is in fact a purchasing power crisis designed to keep the relative value of land up. So to quote a ancient unnamed poverb maker in contrast to the wise professor. We do not live by making one and other work but by consuming the produce of one anothers work. And if we stopped spending altogether then the cause of our starvation that we be not out of work but out of goods. In that case we would be better off out of work as it would conserve our energies longer. Seeing the community is in distress and also that they are not spending much he has jumped to the latter fact as the cause of the former. His economic idea (Sisyphist in origin) that the function of consumption is to make work. The function of consumption is to support life. Sisyphism compels people to save in self defence. or satisfied the Japanese private sectors desire to save? Is one country on its own unable to overcome a global problem? country whose government realizes it cannot run out of money? We have a absurd situation in Ireland of people unable to purchase stuff that is already built. The banks (chiefly based & run out of London through the Dublin conduit) refuse to accept that their books are the wrong way up. Yet – they cannot engage in traditional keynesian drive to produce more as the input costs are so high. They may indeed try but if they do such a thing basic consumption and the ability to purchase houses declines even further as this “asset creation” subtracts further energy from consumption. That is the primary reason for the stagnation in western economies. Therefore to keep the numbers up the banks import labour from their global hinterland, therefore further reducing the average energy density per person. And so the decline continues until it cannot. I’m skeptical about using investment spending since as Dork points out, there has been gross OVER SPENDING in some areas on investment: i.e. better to give consumers more money to spend. Unfortunately Dork suffers from Irish blarney / verbal diarrhea: he uses 100 words where one would do, and I have no intention of reading all his comments. Thus if I’ve misinterpreted what he said, I make no apology. Don’t trouble yourself responding to Cork. He’s in his own little world and nothing you write will penetrate. There is a huge diference between well implemented bottom up fiscal policy (which address private sector’s ability to save, take on debt and spend) versus poorly implemented fiscal policy in conjunction with monetary policy. Don’t we essentially have a “job guarantee?” I believe it’s called massive entitlements+disability. What’s the difference? Japan is an interesting case. Their culture seems to be stuck at the esteem level of Maslow’s hierarchy of needs when it comes to working (a similar culture may also emerge in china over time), I.e. Work seems to be an end in and of itself and not so much a way to enable consume or to provide effective demand, or at least not in the same way that Western nations do. It seems so embedded in their culture that there is little social struggle against increasingly mercantilist policies being rammed down their collective throats. Suicide rates, gory news broadcasts and juvenile entertainment for adults are all very telling about the ills of Japanese socio-economic culture. Perhaps I can take a little “credit” for inducing your illuminating post on secular stagnation. I agree with your statement; “The secular stagnation hypothesis only avoids being a non sequitur if we exclude the most important insight from the analysis – that the government can always spur growth through increased spending.” You will know from my past posts I accept the validity and efficacy of MMT descriptions and presecriptions albeit with some reservations. These reservations do not in any way stop me from supporting the main MMT prescriptions which I see as counter-cyclical stimulus and the Job Guarantee. So I hope we can agree that we are essentially on the same page. “A note to regular readers. Some of the comments recently have been about the need to shift to socialism and abandon the destructive tendencies of capitalism. Apparently, this means that Modern Monetary Theory (MMT) somehow misses the point. This probably refers to me but not necessarily exclusively to me. I accept the correction and apologise if I stray too far into that territory (implying that MMT misses the point) when I raise my reservations about MMT. A. Poor macroeconomic policy (the policies of economic austerity leading to poor demand). C. Growth is being shifted from the developed world to the developing world. I later said that secular stagnation was part of B. On reconsidering it, point B is my weakest contention by far. I agree that secular stagnation (so-called) is only an issue if A (poor macroeconomic policy) applies. I think demographic factors (end of population growth and ageing population) are most likely in the modern world to induce some pressure towards secular stagnation even if macroeconomic policy is good. Note, I say “pressure towards”. This pressue should be able to be resisted effectively by good macroeconomic policy. So we agree on point A and also that the weak point B “evaporates” under good macroeconomic policy. This leaves points C and D.
If you think C. and D. have any validity (and I think you do think so but not necessarily in what you might quite reasonably characterise as the simplistic and doctrinaire form in which I put the issues) I would be interested in your thoughts on these points too. Obviously, if you feel you have covered these points in other posts then just link to them, thanks. The angst of the anti-consumerists and anti-capitalists above misses the point Bill and MMT has made repeatedly. First understand the mechanisms of monetary systems, then decide how to use them properly. It is the “use them properly” where we decide what is consumed and what is invested. We can consume non-consumables (art, entertainment, refurbished goods, etc), and invest in restoring and regenerating cities and in new infrastructure that replaces inefficient and carbon-intensive ones. In other words, these are societal and political and market-making structural choices we can make to direct and redirect behavior to a climate-friendly and sustainable way once we understand how to run a sovereign monetary system at full employment. Keep up the great work, Bill. Change is a comin’! Jeff: “Work seems to be an end in and of itself” in Japan. The Japanese are industrious. But having lived in Japan and studied their language and culture a bit, I think work has more to do with duty and belonging. The Japanese exist in a dense web of responsibility that they feel as burdensome, but they also feel that that’s just how things are. If you work for Sony you are not just an employee, but a member. I don’t agree that “(t)he angst of the anti-consumerists and anti-capitalists above misses the point…” except in the sense that it can miss the point of the (intentionally and logically) limited technical scope of MMT. MMT as a technical descriptive discipline has nothing fundamental to say, so far as I can see, about ownership of the means of production. This is not a strike against MMT. MMT is not intended or developed to examine this issue. It is however an argument for us to extend our thinking beyond MMT and the mechanics of macroeconomics in general. Our thinking needs to extend further into issues of Political Economy and in particular into a Marxian and/or Veblenian analysis of the ownership of the mean of production. Politically, it is precisely the point that we will not get the prescriptive policies of MMT like appropriate government deficit spending and a Job Guarantee whilst under the control of neoliberal ideology. It is equally the point that democratic demand for policies other than neoliberal policy remains ineffective under the current ownership system of our political economy. History shows that temporary gains, as in the Keynesian era, are susceptible to rollback. This is what has occured in the neoliberal era. The consistent feature is that the problem of the ownership of the means of production has not been tackled. Ownership of the means of production (corporate oligarchic ownership) confers control of our society on to the current owners i.e. the capitalist oligarchs. Bourgeoise representative democracy is bought and suborned under this system. Mass democracy is ineffective trending to completely inoperative. The USA shows a nearly compelete expression of this trend. It will take another crisis (such as is already growing in the EU and even occuring in places like Greece and Spain) to reinvigorate the demand for social-democratic policies and hopefully permit a trend back to a more Keynesian-like or MMT-like accommodation between labour and capital. Once and if some of this momentum builds, it will not be enough to halt at some “accommodationary compromise” again. A revolution in ownership must be be pushed through such that capitalist oligarchic ownership is ended and worker cooperative ownership is installed, institutionalised and normalised throughout our societies. Workers need to become the onwers and managers of businesses. The separate owning and managerial classes (who are thoroughly parasitical) need to be abolished. Civic democracy, be it representative, sortitional or some other form, needs to be supplemented by full worker democracy in all enterprises. Hierarchies do not need to be and cannot realistically be abolished but they do need to be vertically compressed. Such command and control (and pedagogical) hierarchies as realistically need to remain must be merit based not ownership based. to add to my point about Japan. I like to always use basic local obervations and dynamics and somehow extend them to the national and international sphere. I would recommend The Wasted Island for a appropaite caustic observation of the British system (and by extension the Dublin system) of control. Sorry for not responding earlier but I was caught inside the Irish accident and emergency nightmare. It is efficient in so much as it manages the flow into the overcrowded hospital system. Many people waiting either die on the spot or get fed up and go home to die. This mind you was in the chief hospital for the entire southern region of Ireland !!!!!!! Me thinks I know of what I speak. Activity in Ireland (car traffic) is higher then at any time since 2008 but the wealth (wellbeing) continues to erode. Its the bankers perfect little Rosemary Baby. Any Dork can see the sick game that is played on peoples lifeforce. It a old game anyhow. Not all Irish people talk like Dork from Cork. The hint of the Austrian Economics is strong with this one. The verbal diahorrea is more in line with that field of inquiry rather how we as a people actually communicate ideas. You’re post here has convinced me that the secular stagnation hypothesis is indeed wrong. If only because Hansen again seems to rely on market forces like capitalists being incentivised to invest because capital complements young people more. As we see though, large levels of youth unemployment exist in many Western countries and we’re not seeing corporates investing but quite the opposite – hoarding – and then having the temerity to claim they need tax cuts! Pumping out babies isn’t going to solve the problem. I guess this corroborates some of the stuff Krugman has been putting up regarding the superior performance of economies that have higher cyclically adjusted deficits. For many decades now, the whole world has used American demand as a kind of sink for demand because neoliberal (read: aristocracy) policies have crushed wages and incomes in their own countries and there’s not enough demand at home. Even as neoliberlaism took hold in the 80s onwards there, the credit machine started replacing this to of course, disastrous long term effects (Hence the WP and Summers claiming we’ll just be lurching from one bubble to another), but still gave the Chinese and the West the demand it needed. The ultimate solution is just to recycle capital properly as they did post WW2 until the 1960s. Take wealth away from people that put it into the Cayman islands (33% of the world’s wealth is held offshore) and give it to people that will spend it. That would do more to incentivise economic activity (i.e. the function of the economic system in some ways). Governments can do that through fiscal policy or less likely easily through monetary policy (inflation). Eventually investment will follow, and with that supply. The sanitised version above works too, in which case we hope the spending leakage from the bureacracy and corruption is outweighed by the benefit of the multiplier effect. I’d probably post more on economics if I could, but I never have the time to do it proper justice like you have here. Being a student is the best time to be blogging! You can see how the british balance of payments has changed over time. A game orbiting real goods and only real goods. We can claerly see this is not “free trade” of comparative advantage but a system of directing a massive amount of energy towards financial capitals. Much like Venice of the middle ages. The extreme lack of purchasing power in Spain can be explained by its closer surplus position relative to the UK in recent years. We can see the purpose of “trade” in the eurozone is to get access to tokens rather then goods. The UK is at the fulcrum of EU / eurozone internal trade. To be anti Keynesian is not to be automatically Austrian. You perhaps have bought into this bank duality meme common on sites such as Zero hedge. I know of no Austrian that is anti Venetian . No Austrian that declares there is great abundance in this world. No Austrian that believes in the water into wine parable. No Austrian that believes in free money tokens. Keynes was obviously a banking lobbyist. There is not great mystery in that. Since the great war he was working inside the bowels of the British banking establishment. Jesus – what else could he be ? This paints a picture that doesn’t resonate.By all mean lets maintain full employment through deficit spending.But is the lack of aggregate demand& unemployment really caused by over saving.I know lots of people who simply don’t earn enough to make it to the end of the month let alone have enough income to put aside in savings. Basic living costs are too high and wages and other sources of income(welfare and benfits) are too low.The non government sector isn’t spending,becausewe don’t have any money to do so.Who is it exactly that has all this spare money lieing about in saving accounts? Effem, welfare is not a JOB guarantee. You can have either unemployed or employed buffer stocks, despite all talk of ‘scroungers’ and the like.